The Wyndham Centre – Who are we? 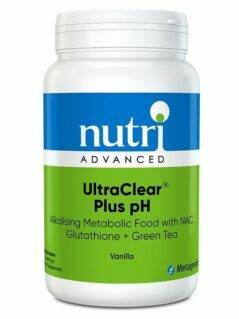 View cart “UltraClear Plus pH Vanilla 966g by Nutri” has been added to your cart. 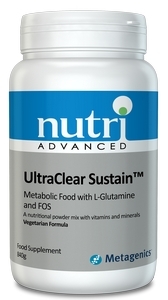 • UltraClear Sustain is a powdered mix, which provides targeted nutrition for powerful gastrointestinal support. 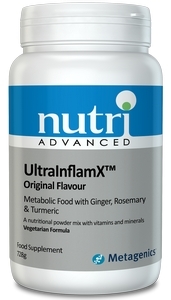 • Nutritionally supports the repair of the gastrointestinal tissue and puts back important nutrients. • Features specially processed high amylose rice flour, augmented with essential amino acids to increase the biological value of the protein. • Fortified with nutrients such as zinc picolinate, L-glutamine, and pantothenic acid to nutritionally support gastrointestinal mucosa integrity. • Provides fructooligosaccharides (FOS) as a probiotic. • Comes with a comprehensive Patient Guide for complete program guidelines (also available on Nutri website). Contains: Rice protein concentrate, Rice syrup solids, Rice flour, Olive oil, Medium chain triglycerides, Natural flavours, Silica. †Saturated fat is contributed by the beneficial fat medium chain triglycerides which have recognized health benefits. †† ChromeMate® GTF is a registered trademark of InterHealth, Inc. Blend, shake or briskly stir 4 level scoops into 8 ounces of water or juice. Not recommended during pregnancy or whilst breastfeeding. Not recommended for children under 12 years of age. The History of The Wyndham Centre as we Celebrate our 40th Year! © The Wyndham Centre - Site by WPEagle.